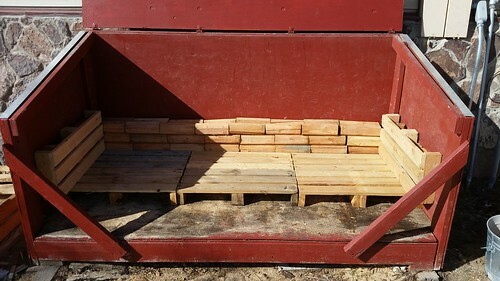 We've had some issues with water getting into the wood box and pooling inside, and while we keep the bottom lined with pallets, if water stays there, it tends to "wick" up into the pressed-sawdust fire logs, dissolving them. Lisa determined that the ground under the box in the rear had settled, which makes sense because we load it from back to front and thus there's usually much more weight in the back, and therefore we needed to fix the tilt. We intentionally ran down our wood supply (we still have a couple of weeks' worth of logs on a pallet in the garage) and did the work this morning before the forecast snowstorm arrived. Yesterday, I unloaded the remaining wood from the box. This was mostly the Douglas fir "fence post" firewood that we used to buy from Big R before they switched to the North Idaho Energy Logs. 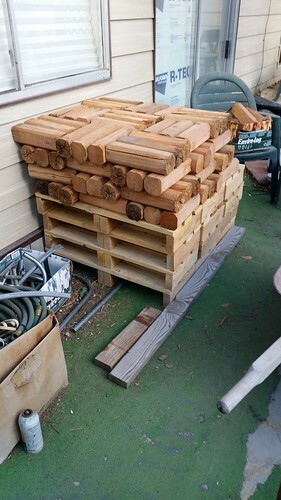 I stacked them up on the back patio under cover, but even if the rain or snow gets in here, it's not a problem because they don't melt like the fire logs do. Lisa would like to be able to buy these "fence posts" but we've not seen them available locally since Big R dropped them. The fence posts are sitting on three ranks of the mini-pallets on which the fire logs are packaged. 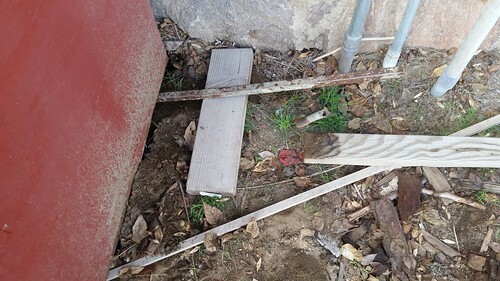 Here's the empty box after I took out the fence posts and the slightly soggy pallets that were lining the box yesterday. Not all of the sawdust was gone because the combination of sawdust from dissolved fire logs and pooling water had formed Pycrete. The area hadn't been getting any direct sunlight, and therefore overnight air temperatures of as low as -11°C and not much above zero in the day had kept the mixture mostly solid. 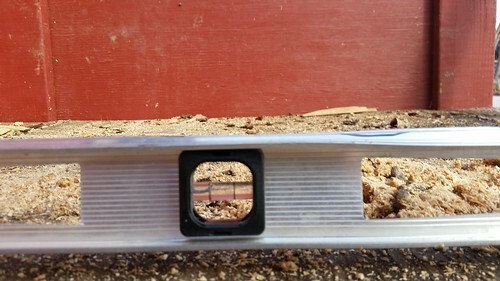 We cleared away from the sides of the wood box and Lisa inserted this metal rod that we purchased from Twin Cities Surplus in Reno for the princely sum of $0.90 and I made myself useful by standing on it, thus levering the box up high enough for Lisa to insert wooden blocks in the rear. We then repeated the process on the other side. We did have to do a little bit of adjustment to get the amount of lift the same on both sides, on account of originally it twisted the box enough that the lid wouldn't shut properly, but we got it done eventually. Setting a level on a relatively un-Pykrete-encrusted part of the box confirmed that it now leans forward again, which is what it should do. Now any water that does get into the box should drain out the front. Letting the box sit out in the morning sun for a while softened the Pykrete enough that Lisa was able to chip it off the plywood lining, and I shoveled it into a bucket. If it ever dries out, we should be able to burn it as well, recovering a bit of the loss from dissolved fire logs. (The logs cost about $1 each.) 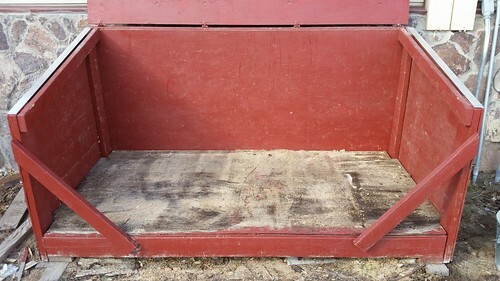 This piece of plywood sits on top of the actual floor of the wood box as a liner and can be replace if it ever rots out or gets damaged. As the old large pallets lining the box were still soggy, I re-lined the box with the small mini-pallets along the bottom and (at Lisa's suggestion) sides. We put a couple of rows of the fence posts in the back. Lisa will, before we next buy a pallet of logs, cut notches in a couple of the mini-pallets so that we can set one more row of pallets in the front of the box. Lisa had me walk around inside the empty fire box to make sure it wasn't flexing under my weight, which it was not. 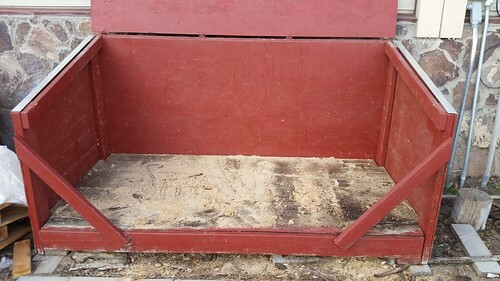 She says that this summer, when it's reliably hot and dry, we'll empty the box completely, tip it up, and rework the entire area under it to level things the way she wants. This will probably disturb our local lizards for a while, but they'll just have to get used to it.